Ornamental dense shrub or small tree with terminal pink-yellow flowers on tree form or yellow flowers on the coastal shrub form. 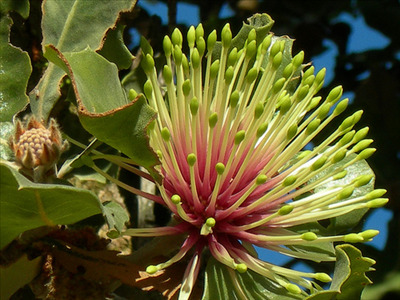 Flowers are more like a dryandra than a banksia. Tolerant of light frost and extended dry periods once established. Prefers well-drained soils in full or partial sun. Grows well on the coast. Excellent windbreak and cut flower.